"When Robert Kirkland built DPA, his goal was to bring the world to Obion County," said museum exhibit director, Jennifer Wildes. "He did that, and today one of the ways we honor his vision is by hosting temporary exhibits like this one for our guests from around the world." "Towers of Tomorrow with LEGO Bricks" features 20 of the world's most astonishing skyscrapers from the USA, Australia, Asia, Canada and the United Arab Emirates constructed with breathtaking architectural detail and accuracy by Australia's Ryan McNaught, the only certified LEGO professional in the Southern Hemisphere. The exhibit includes some of the most iconic and eye popping towers from across North America including New York's Empire State Building, the Chrysler Building and Chicago's Willis Tower. Over 20 skyscrapers, on a scale of 1:200 and built with stunning precision and attention to detail are displayed throughout the gallery. The engineering and artistry are to be admired by artists, engineers as well as people of all walks of life, both young and old. LEGO lovers will be particularly captivated, not only by the towers, but by the thousands of LEGO bricks available for building on the open display islands. Inspired by the towers, visitors can use their imagination to build their own architectural creations. Pictured at left is Suni Ray Wright Johnson, daughter of Wendi Wright and Eric Johnson of Union City building her own towers of tomorrow. DPA secured this amazing exhibit from Sydney Living Museums (SLM), one of Australia's largest museum bodies. SLM boasts that its traveling exhibitions stimulate an audience interested in history, architecture and design. 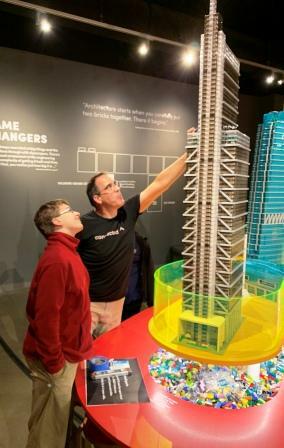 "Towers of Tomorrow with LEGO Bricks" was built by Melbourne's Ryan McNaught, aka "The Brickman," who used more than half a million LEGO bricks and well over 2,400 hours to build the structures featured in the exhibit. More information on the museum, park and a complete listing of all confirmed 2019 programs and events can be found at DiscoveryParkofAmerica.com and by following DPA on Facebook, Instagram and Twitter. Discovery Park of America is located at 830 Everett Blvd. in Union City, Tenn. and is open Tuesdays through Sundays from 10:00 a.m. until 5:00 p.m. 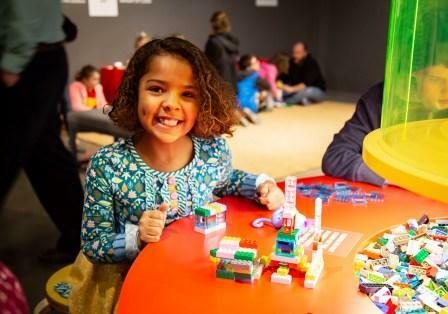 The mission of Discovery Park of America, a premier world-class museum and heritage park located in Union City, Tennessee, is to inspire children and adults see beyond. Included is a 100,000-square-foot museum featuring 10 interactive exhibit galleries with additional space for temporary exhibits from around the world and a 50-acre heritage park. Discovery Park of America is a 501(c)(3) public charity funded by generous individuals, corporations and foundations including its principal funder, the Robert E. and Jenny D. Kirkland Foundation. For more information, visit DiscoveryParkofAmerica.com or follow DPA on Facebook, Instagram and Twitter.